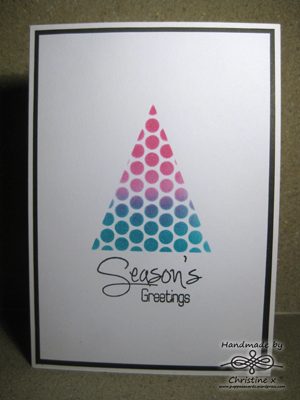 I have finally started to test out some Christmas card designs! I have been meaning to do this for a while now but have not had any kind of inspiration at all. I have been trawling through magazines and blogs to try to become unstuck but found this wasn’t helping at all. Yesterday I ordered myself some new stamps and all of a sudden I have been able to make cards again – before the new stamps have arrived. Typical. This was really simple to achieve, I used post its to mask off a triangular area and then taped down some sequin waste through which I blended Peacock Feathers and Picked Raspberry Distress Inks. The sentiment is from Clearly Besotted’s Signature Christmas stamp set – I love the handwriting and the sentiments from this stamp set have become my go to Christmas stamps. 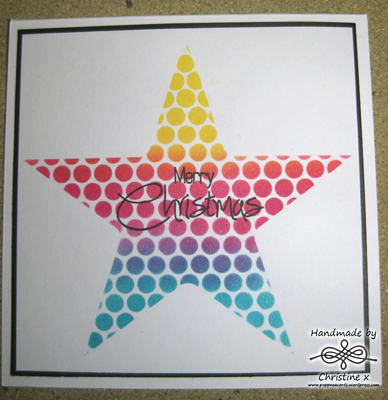 For this one I cut out a star shape using my Silhouette Cameo to create the mask. I changed the orientation of the sequin waste and then blended the inks once again, using Squeezed Lemonade for the top section due to the size of the shape. The sentiment is from the same stamp set. Off to make some more while I am still inspired!